The Time Delta C flow meter is a non intrusive, non evasive clamp-on ultrasonic flow meter, which is suitable for measuring the flow and total flow of liquids in closed pipes. It is particularly useful where high accuracy is required and the flow meter needs to be installed without shutting down the process. 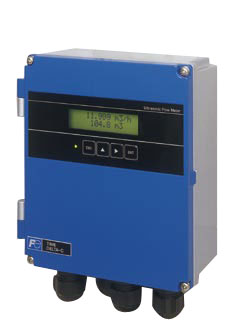 The Time Delta C is the latest release in the Fuji Electric flow metering range and uses the Micro processor and digital signal processing technology to provide a compact, lightweight solution with accuracies that are better than 1% of Flow rate. The flow meter is made up of two items; Clamp on sensors, which come in a range of sizes and types to suit pipe diameters from 13mm to 6000mm. The sensors are clamped to the outside of the pipe using two stainless steel straps. The second part of the flowmeter is the flow transmitter, which provides an easy to use user interface and allows the flow and total to be configured in a variety of engineering units. The rugged construction of the flow transmitter makes it ideal for installation in internal and external environments where IP66 protection is required. Where flow rates and totals need to be transmitted, the Time Delta C provides a selection of outputs which include 4-20mA, relay, TTL, RS232 and RS485(Modbus). Configuration of the unit can be done from push buttons on the front panel. Alternatively free PC compatible software is available, allowing multiple configurations to be stored and downloaded to flowmeter from a PC. Ideal for flow surveys, this portable ultrasonic flow meter offer convenience with a level of performance close to the fixed type Time Delta C.